In another month or so, The Wild Geeks Adventure Club will be a year old. Since that time, the geeks have been on many adventures, be it cycling, hiking, camping or even eating, 2008 promises more. There have never been one time that all the geeks could get to go out adventuring together. Understandably due to different interest, work, available time or differing taste, it has been difficult to get all together to participate in an adventure at the same time. Should that be 2008's goal? Hahaha... I don't know, but if all are willing, maybe it is possible. Some of you might have noticed that the Wild Geeks' logo is changed. This is in part due to the growth of Wild Geeks as a community. What started out as just The Wild Geeks Adventure Club, has now spawned new geek communities. The other reasons for the change in the logo are that the original logo is too colorful and is expensive to reproduce for T-Shirts. Also, it is too complicated for embroidery work for caps or T-shirt. The new logo is designed to solve these problems and most importantly to reflect the geek spirit for adventures and their cheeky ideals... ahem! 1. The Third Eye - This is a community of geeks who are interested in photography and all the related tools of the trade. If you own a camera or phone camera, you should take a look at this community. 2. 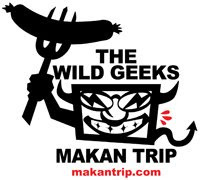 Makan Trip (http://makantrip.com) - This long time food blog has now grown into a community of geeks that are interested in going on food hunting trips anywhere and everywhere. Their proud slogan is "Makan (Eat) First, Think Later." In fact they are going on their second Peninsular Malaysia food trip next week to the East coast. 3. BikeTrial Malaysia (http://biketrial.ning.com) - This is a very niche and specialized community with interest in the very technical nature of biketrial cycling. Still very new to Malaysia, Biketrial Malaysia hope to make BikeTrials or Observed trials a mainstream cycling sport in Malaysia for all to enjoy. These communities are open to all whom have interests and want to share and discuss their interests with other geeks. So... Be Wild! Be Geeks!